A panel of CEOs at the Mobile First Look: Strategy 2012 conference touched on everything that marketers will need to know this year. Marketers that aren’t on mobile are missing out on customer retention and transactions as well as opportunities to connect with a group of customers literally in the palms of their hands. “The mobile channel has proven itself thousand-fold. Mobile users are loyal users, they are spending more money than you think they are because, for them, mobile is a loyalty program and focusing on that is key” said Erik McMillan, CEO of BestFit Mobile, Austin, TX. A hot topic in the panel was the idea of security and how it will affect mobile marketers and consumers in 2012. Some of the panelists thought that viruses within mobile tactics such as bar codes, SMS and Web could trick consumers into giving up personal information. Brands should work with their service providers to ensure that they are taking as many precautions as possible to avoid any kind of security breech. An unprecedented 15% of people in the UK browsing retail sites over the Christmas period are expected to do so through a mobile device, according to cloud analytic-based findings based on the IBM Coremetrics Benchmark, which gathers real-time data directly from the sites of more than 150 UK retailers by IBM. Online shopping sales in November – as retailers launch earlier seasonal promotions – are expected to grow by as much as 10% against November 2010. In October, 12% of people used a mobile device to log onto a retailer’s site, up from 3.7% in October 2010, with 11% of all online sales in October, up from 3.1% in October 2010. This is a great time if your not already using mobile marketing to start!! Within your SMS message you could include a link to your website, therefore encouraging customers to browse your website which could result in a purchase. And as consumer purchasing behaviour is changing with the advancements of M-Commerce you can ensure that your are adapting to consumer purchasing habits to meet current customer wants and needs. 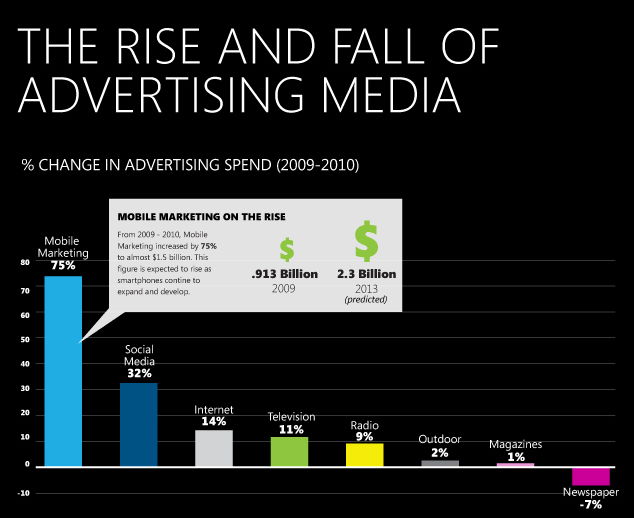 And clearly judging from this graph many companies agree with us and are increasing their advertising spend on Mobile Marketing. With it being on the rise you need to make sure you keep up with current marketing trends otherwise your competitors may be communicating directly with your target market and in turn stealing potential or existing customers! Want to find out more about Mobile Marketing? Well why not visit our SMileS Website to learn about our online portal or call us directly on 01484 465160.